Following from the success of our first ever Medical Student Essay Competition we are delighted to announce that we will continue with this competition for 2018/19. This competition aims to encourage medical students to develop an interest in Clinical Radiology and promote Radiology to undergraduates. Has your medical school incorporated the Royal College of Radiologists Undergraduate Radiology Curriculum into the Medical School curriculum? Are you involved with your University Radiology Society? Have you done or plan on doing a Radiology Elective? Have you undertaken any Student Selected Components in Radiology during Medical School? We want to hear all about your experience of Radiology during medical school and any ideas you have that will raise more awareness of the specialty. It is up to you how you interpret the essay title which gives you the opportunity to be creative! Applicants must submit a 1500 word essay, including references and tables, along with the student’s full name, medical school and a supporting statement from the supervising Consultant Radiologist who can confirm that it is the original work of the applicant. The SRT Committee will judge the essays and the decision of the committee is final and binding. The winner will be invited to attend the 2019 SRT Annual Conference on 16th & 17th May (a prize worth £150) and a book prize. Applications should be sent to: president@thesrt.co.uk by 5th April 2019. Winner: Stefan Lam, 3rd year medical student, Barts and The London School of Medicine. The SRT Committee are pleased to introduce ‘The SRT Medical Student Essay Competition’ for the very first time. This prize is intended to encourage medical students to develop an interest in Clinical Radiology and enhance their experience of the specialty during their medical studies. 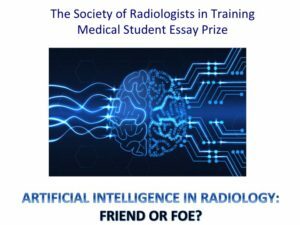 Artificial Intelligence in Radiology – Friend or Foe? The winner will be invited to attend the next SRT Annual Conference (a prize worth £150). Applications should be sent to: secretary@thesrt.co.uk by 13th April 2018.